Coffee with the CEO is an interactive session conducted at DCSMAT, providing an opportunity for students to meet people from different walks of business and industry sharing their success stories. 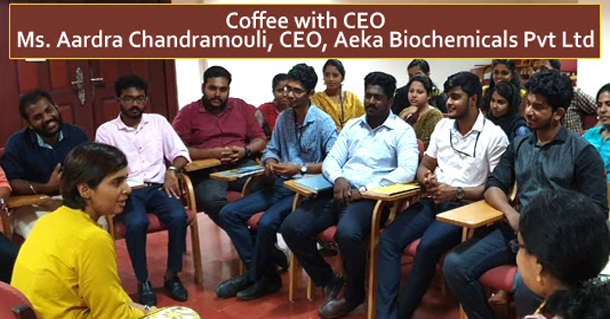 This edition of the initiative featured Ms. Aardra Chandramouli, founder and managing director of AekaBiochemicals Pvt Ltd, the first biotech and biochemical startup venture based out of Trivandrum in Kerala wholly owned by women. The session took place at DCSMAT Trivandrum on 10 April 2019. Aeka Biochemicals is built on multiple agendas that addressed different social issues. Looking through a green and a socially responsible lens, it dishes out affordable eco-friendly biotech products. Ms. Aardra narrated the challenges she faced during her entrepreneurial journey, the efforts put in the form of research, along with the technical issues faced by the team initially. Citing her own life as an example, she advised and motivated the students to plan their career as an entrepreneur in a systematic and planned manner.